It looks almost everything has been built with LEGO by now, so it is the case of Walking Excavators or Spider Diggers. And also some photos below. You will find a lot of them at swissbager BrickShelf gallery. This is a tethered pneumatic remotely controlled digger which looks to operate very gently by the way. Fully pneumatic excavator arm with 4 functions. Upper structure slew driven by two old style 9V motors. All functions above, served from a remote control with own compressor powered with four 9V electric motors. The under carriage is a "4-legged" structure with two rear large wheels and two frontal legs equipped with feet and small wheels, like the real thing. The four legs can be positioned vertically with pneumatic cylinders and positioned manually on their horizontal angle, so that the model can work on steep areas. Below a few self explanatory videos and photos that I found really amazing and illustrative of walking excavators capabilities. 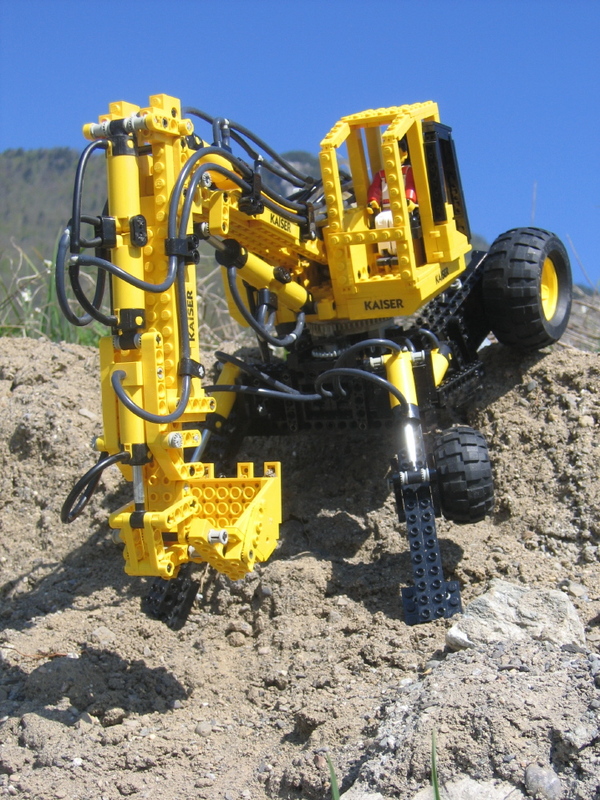 Definitely a great challenge for any LEGO Technic builder! It just reminds me to ask, when does LEGO give us another fully featured pneumatic model, like 8455. As a closing note, there are a few manufacturers from these engineering wonders (Menzi Muck, Kaiser, Euromach) so it is easy to Google for them and find a lot more interesting videos, photographs and info. There is even a facebook group dedicated to them, where the fans post the most incredible findings. Awesome MOC! I wonder if the person who invented the real walking excavator built one out of LEGO elements first. :P It seems like something a LEGO fan could dream up. Indeed! I hope LEGO considers the idea of doing an official model of a walking excavator! This is really awesome! Maybe he could update the design with PF's? What an awesome machine. 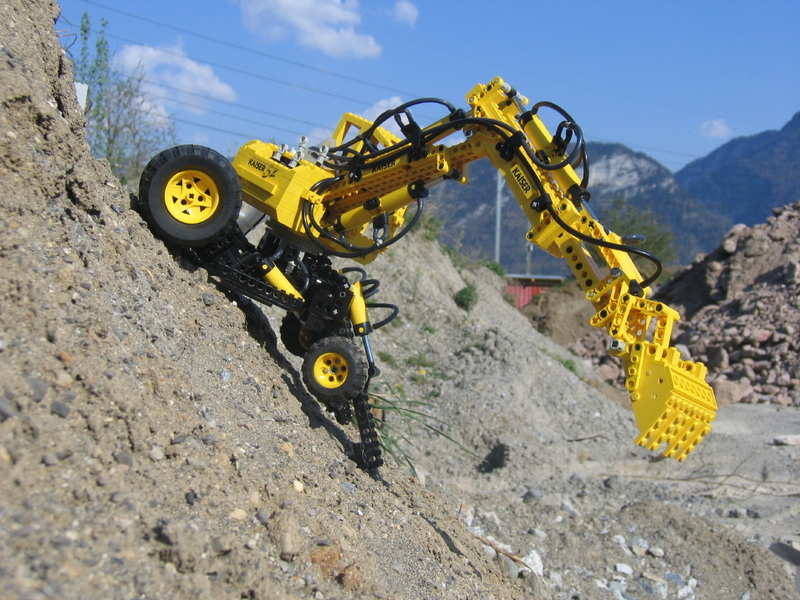 The strenth, power, control, realism and four function functionality of the digging arm is increadable. It is everything Technic should be, wheather it's an official set or a MOC, THIS is the best Technic model i've seen in a while. It's even remote controlled! Long live pneumatics! That was quite cool, I always enjoy seeing someone build working models of bizarre/uncommon/unorthodox machines. Unfortunately, though, I doubt we'll ever see an official Lego walking excavator, as it seems that they tend to stick to models of more recognizable machines. This is so impressive. What I most like is the fact, you used "old / classic" bricks. 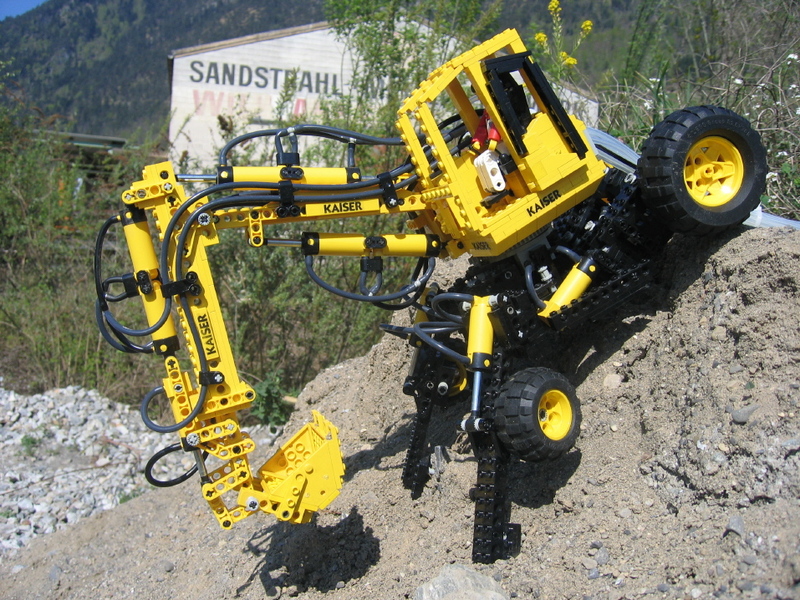 20 years ago I had an regular Lego Technik Excavator (you could also build an harvestor from them same bricks)which used the same yellow bricks and pneumatics. Unfortunately I was never that creative.